SueBE: What are Mim House’s Spring 2014 titles? 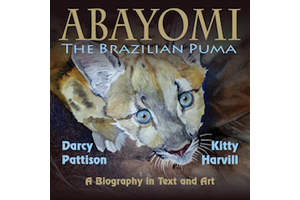 Abayomi, the Brazilian Puma: The True Story of an Orphaned Cub (March, 2014) is another collaboration with illustrator Kitty Harvill. Her genius is to do almost museum-quality portraits of a specific individual animal. Nothing is generic in her work. This is another touching story from the wild to add to Wisdom’s story. The Girl, the Gypsy & the Gargoyle (March, 2014) started when I read Michelangelo’s statement, “Every block of stone has a statue inside it and it is the task of a sculptor to discover it.” Perversely, I wondered if someone could be trapped in stone just for the purpose of being sculpted. Saucy and Bubba: A Hansel and Gretel Tale (April, 2014 release) is about a step-family dealing with alcoholism and a brother/sister who run away from home. Vagabonds is my American fantasy (May, 2014). For decades, the southern states have witnessed the relentless migration of vagabonds from Mexico. They are now found as far north as the Ozarks of southern Missouri. No one knows why they keep traveling north, ever northward. Until now. In the tradition of Charlotte’s Web or The Underneath comes the American fantasy, VAGABONDS, the saga of El Garro’s armadillo colony, the scouts and pioneers who have always been at the forefront of the migration. SueBE: What do you have to say to writers who see independent publishing as a short cut? Publishing independently means you are a small business. In the U.S., most small businesses take a minimum of three years to turn a profit and during that time, the business-person works hard. Very hard. Why would you think being an independent publisher is any different? You must write, produce and market stories that someone will want to read. You must develop or hire out skills to edit and produce the story. You must find audiences who want to read what you write and find ways to get the word out to them on a consistent basis that a new story is available. Indie publishing is hard work, with no guarantees that it will succeed. My long experience in traditional publishing grounded me in the need for the highest quality work. You must learn that somewhere and the marketplace is a harsh place to learn it. There are no shortcuts for learning to write well. It’s a profession with a long apprenticeship. Only after you’ve mastered writing skills should you attempt this. SueBE: What have you been able to do as an independent author that you were unable to do when you were publishing traditionally? Publish books that I believe in. Market flexibility to put the right book in the hands of the right reader. Both are curses and blessings, depending on the day you ask me. SueBE: Would you ever consider traditionally publishing again? If so, under what circumstances? If not, why not? SueBE: What have you learned that you wished you knew when you started publishing on your own? Marketing. I wish I had worked twenty years somewhere in marketing, because while the Internet sounds perfect for this, it’s not easy. I have had to learn so many concepts and principles that are foreign to my basic skills of plotting, characterization, pacing and so on. Writing, I can do. Marketing is always a struggle. Check back with me in three years and I’ll tell you if this small business has made it or not! SueBE: What’s next for Mims House? SueBE: Special thanks to Darcy for taking the time to answer my questions. If you have any questions for Darcy, be sure to ask them below. SueBE: When and why did you start independently publishing? 2008: First lesson: POD Publishing can be successful even without blockbuster sales. 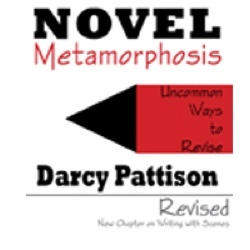 I started teaching a Novel Revision Retreat (darcypattison.com/speaking) around the U.S. in 1999, and by 2008, the workbook for the retreat was substantial enough that retreat coordinators didn’t want to print it off. After investigating, I decided to publish the workbook, NOVEL METAMORPHOSIS: UNCOMMON WAYS TO REVISE, using print-on-demand (POD) technology. The workbook has been a steady seller because I had a built-in audience from my retreats. It just made sense to publish this one myself. Think about it: if 10,000 people decide to write a novel, perhaps 1000 finish. Of those 1000, perhaps 100 will actually do a revision. That means the audience for beginning writers is 10,000, while the audience for the advanced writer who revises is only 100. Big companies like Writer’s Digest can’t make enough money to support a book about revision. But publishing it myself meant that I didn’t have to have thousands of sales to make money; it was successful for me with fewer sales because I had cut out the middle-man, the publisher. SueBE: This workbook is my favorite revision tool and I know you are doing other books for writers, like How to Write a Children’s Picture Book and The Book Trailer Manual. But how did you move into publishing children’s books? 2011: Second lesson: It’s an easy step from nonfiction, how-to-write books to full color children’s picture books. For three years, I learned many skills to produce a great book in POD or ebook. But I didn’t want to move into children’s picture books because of the color issues and the marketing issues. Then, I won a contest. To promote the movie for “The Help,” a children’s story contest was announced. I took a story that had been rejected, but I still loved and submitted. I won. It’s the only contest I ever entered and the only one I ever won. The prize was professional illustrations. Now I ask you: what are you supposed to do with color illustrations? The answer was obvious: produce a full-color children’s picture book. I created 11 Ways to Ruin a Photograph . It’s the story of a girl whose military father must go overseas for a year. She decides that while he’s away, it is NOT a family photo album and she ruins every family photo until he gets back. The skills I had learned in producing nonfiction how-to-write books transferred easily to children’s picture books. I am proud of this book, but I did little promotion for it and it has had modest sales. 2012: Third lesson: I can produce quality books. Still I was just dabbling in indie publishing and I wasn’t whole-heartedly committed. Here’s the question: what do you do with a story that you believe in, but can’t get an editor interested in publishing? In March, 2011, news of the Japanese earthquake and tsunami devastated the world. I searched for and found an amazing story of survival. The oldest bird in the world, banded since December 10, 1956, is Wisdom, a Laysan albatross on Midway Island. She survived the tsunami. Within six weeks of the disaster, I had contacted biologist on Midway, researched her life and written a story. But I could not find a buyer. An illustrator friend, Kitty Harvill — who had several highly recognized picture books to her credit—read the story and we agreed to publish the book together. WISDOM, THE MIDWAY ALBATROSS: Surviving the Japanese Tsunami and other Disaster for over 60 Years won the Writer’s Digest Self-Published award for children’s picture books, a Next-Gen Honor award for children’s nonfiction picture books and a Starred Review in Publisher’s Weekly. It was the Starred Review that floored me. My traditionally published books have received starred reviews from Kirkus and BCCB, but I’d never gotten a PW star. Publishing a quality picture book that found acclaim in the traditional marketplace was amazing. And it sold, even matching or outselling some of my other picture books. And because there’s no middle man of a publisher, I receive a larger percentage of the profits to split with the illustrator. SueBE: A lot of writers see independent publishing as a way to maintain complete control over their books. What is your take on this? Indie publishing isn’t about “creative control,” at least not in the way many people understand that term. It’s not about making sure a character has a white hat on page twelve. Rather, it’s about choosing what books to take to market. It’s not about putting books “out there.” Instead, it’s about putting the right books in the hands of the right readers. I took time to look over the stories I had written, evaluating them as a traditional publisher would. I don’t write blockbuster stories; instead, I write odd and quirky stories. Independent publishing was right for me because I had an independent, slightly rebellious slant on stories. An independent voice needs an indie way to publish, I decided. SueBE again: Stay tuned tomorrow for more from Darcy including her list of spring, 2014 titles! “. . . 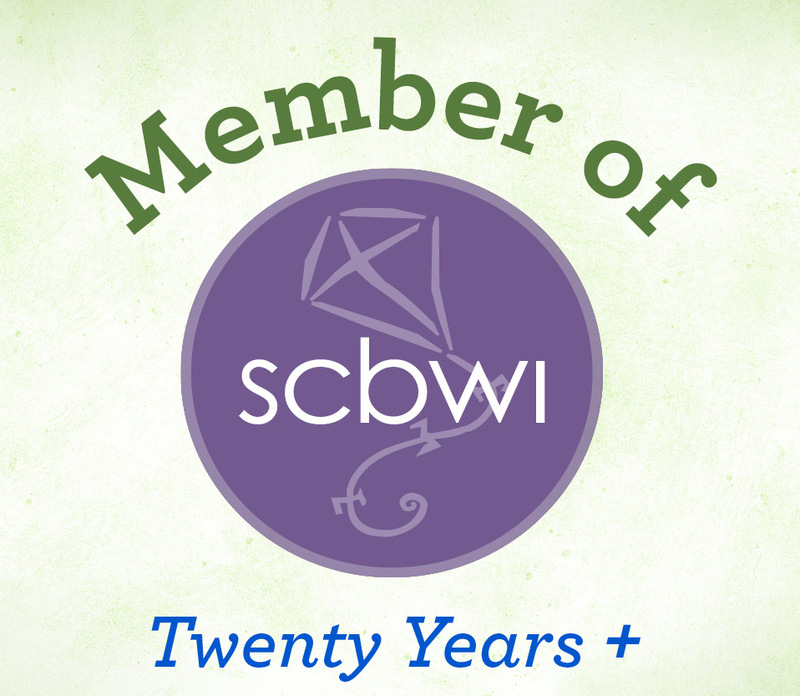 The award is open to current writer and/or illustrator SCBWI members who have independently-published a board book, picture book, chapter book, middle grade, or young adult novel through an established self- publishing enterprise or individually self-published. Submissions must be submitted in traditionally bound form, contain an ISBN number, and provide evidence of Copyright registration. Entries may not have been previously published in any print or digital form prior to the self-published form and SCBWI reserves the right to disqualify books published by enterprises that we believe, in our discretion, operate in a predatory or unprofessional manner. 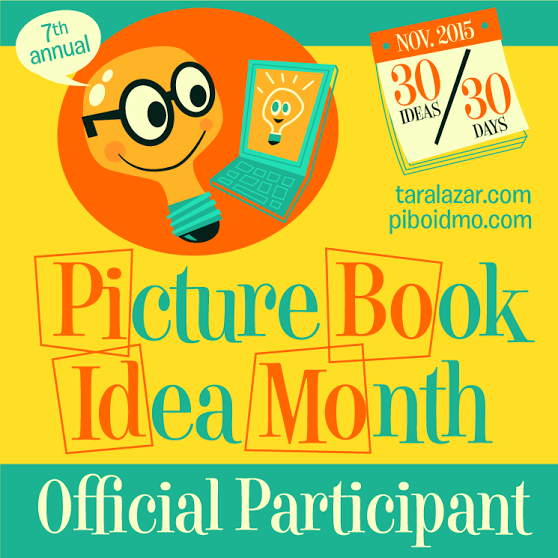 One winner and one honor book will be chosen by a panel of industry professionals and will focus on quality of writing and concept, quality of illustrations (if applicable), professional presentation, and editing and design.” You can read the full announcement here. What I love most about this award is that it not only recognizes this important element of publishing (self-publishing) but all entries must clearly be geared to compete commercially with traditionally published titles. 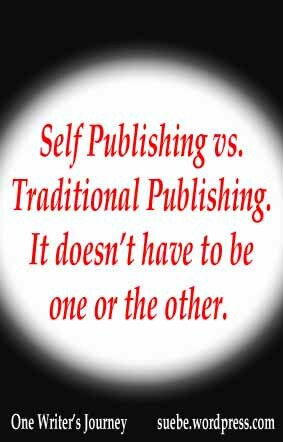 If you chose to make your living self-publishing your work, that’s fine, but it has to be geared to compete in every way with the work put out by Harcourt, HarperCollins and other traditional publishers. What say, you? Does this encourage you to self-publish? I have to admit it — I am one of the many people who has an issue with e-books. Yes, there are many of us. Those of you charging around with your Nooks and your Kindles may be in denial, but we are here. It isn’t that we are all techno-phobic. I’m working on a computer. I have a wireless keyboard and soon will be able to work on the TV in the living room as well as a screen in the basement (where the treadmill is). I love technology. But I don’t love e-books as a whole. I’ve sampled a good number of them and except for the ones put out by traditional publishers, I usually find them wanting. As loathe was we are to admit it, if a publisher won’t take a manuscript, there is often a very good reason. But not just any author can be included on the Argo Navis lists because author’s cannot sign up their own works. This has to be done by their agents. I’m okay with it and, I have to say, I would definitely consider an Argo Navis e-book. Their policy may seem exclusionary, but when that means that I don’t have to sift through the dreak that couldn’t make it out of the slushpile, I’m cool with that. Special thanks to Lee Wind who brought this service to my attention via the SCBWI blog.